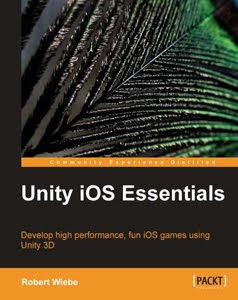 I recommend this book as an excellent introduction to Unity development for iOS devices, well suited for Unity developers for the desktop that are taking their first steps in mobile game development for iOS. The book opens with an emphasis on planning the application, which is a topic that anyone that has created a mobile game can appreciate. The initial three chapters cover comparing iOS device features, iOS mobile concepts in general, and how the Unity toolset is applied within that context. These introductory chapters are replete with advice and best practice specifics regarding what contributes to a successful game product for iOS mobile. After setting the foundation, the book takes a detailed, step-by-step, project oriented approach in learning to create your first game for iOS devices. This content should be very accessible to any developer that has a good overall knowledge of game development with Unity. From there, the book enters the more technical aspect of how the iOS application functions in the greater enterprise. This presents something of an unavoidable steep learning curve for developers that are engaging with this for the first time. Again, the book takes a detailed, step-by-step approach and includes many useful tips and suggestions. Anyone that is interested in this book is probably familiar with the Unity Car Tutorial, and the book uses that resource and the JCar project to take the reader on a very detailed process of creating a physics-based driving game using iOS device features that is really well conceived. The book does a good job in introducing techniques for optimizing lighting, fx, and shaders for for iOS games – again using step-by-step examples. Lastly, the book addresses deployment and web-based player management. To get the most from this book, a developer should have previous experience with Unity, a 3D modeling application, a digital imaging modeling application, and a Max OS X development system for XCode. Given the scope of the book, this is an excellent way to explore a trial use of Unity Pro and Unity iOS.